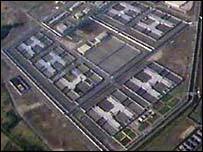 ... 1981 (30 years ago today), a Belfast prison hunger strike ended after 10 persons had died over the course of 7 months. Irish Republican prisoners had begun the strike to protest their treatment, as criminals rather than as POWs, at the prison (right) known to the British as the Maze and to Nationalists as Long Kesh. (photo credit) As reported by the BBC, British Prime Minister Margaret Thatcher (prior posts) had rejected the strikers' complaints with the words, "Crime is crime is crime. It is not political." Nevertheless, "[a] contemporary survey of 73 newspapers around the world suggested world opinion was sympathetic to the Republican cause."